Are there rebates for insulation? In NJ, there are rebates for insulation. You can get an instant rebate with Coastal Insulation. $2,000.00/$3,000.00/$4,000.00 or 50% of job cost. Have our certified energy consultant come to your home and let you know all of the details! There is great financing available also with this program! We are an approved contractor, and we are here meet all of your needs! Want spray foam, but know it doesn't fit your budget? With a big rebate and zero percent loans... spray foam can be done possibly with no money out of pocket! How can I make my home more comfortable? Air sealing your attic, basement sill plate, and or crawl space areas provides instant relief from driven air. By adding insulation, you add comfort instantly. This can be done with many materials in many areas of your home. Coastal Insulation recommends that you always start at the top, air seal and insulate your attic area, than to the bottom air seal and insulate your basement sill plate area or spray foam your crawl space walls. If you are in an older home, we will tell you the sides are just as important as the top! We can provide dense packing to existing walls with cellulose insulation. By spray foaming a crawl space walls, you are making your home much more comfortable! If you have a water issue in your crawl space area, we like to install 12 mil scrim reinforced vapor barrier along with the spray foam insulation! How do I air seal my attic? Air sealing is not complicated. However it is time consuming and can be itchy! Air sealing can be done by one part foam, and other materials. One part foam is the industry standard, and can be performed by your local insulation company Coastal Insulation. Should I seal my duct work in my attic when adding insulation? Yes and there are many reasons why you should. In retrofit we prefer to use blown in cellulose, which is a dense material, and it is fine. This material insulates much better in a retrofit application. The fine dust, can infiltrate your system by the gaps, and large openings in your system's ductwork. Another major reason is why would you leave gaps, cracks, and holes in your ductwork? These openings in your ductwork can allow for unconditioned air to enter your HVAC system, allow bugs and pests to live and die in your supplied air system (after the filter), and also allow allergians into you system after the filter! We offer complete packages, covering all of your needs for a safe and comfortable home! What can I do to save money on my energy bills? What is the best way to insulate a crawl space? The best way to insulate your crawl space is to insulate the walls with closed cell spray foam. With a dirt floor you should install a 12 mil scrim reinforced vapor barrier. Conditioning the space only adds to the comfort of your home above!! What level should my insulation be in NJ? In most parts of NJ you should have a total of R-49. Always air seal before adding new insulation, you want to get the best out of your insulation and by stopping driven air you can achieve this! Have one of Coastal Insulation's Energy Experts come to your home and give you a free assessment of your attic insulation and air sealing needs! When insulating my crawl space do I need to insulate my HVAC ducts? Depends on where your home is located! If next to a large body of water or in a flood plane, abesolutly! Not only should you insulate the duct work, you should seal the duct work as well! Coastal Insulation offers two ways to do this: One is seal with mastic and wrap the ducts with R-8 or R-11 duct insulation. Our prefered method is to insulate and seal in one shot! We can do this by insulating with closed cell spray foam. The spray foam not only seals the duct work, but protects the duct work from any water damage. This insulation can withstand average flooding, and typical water vapor from flooding. While it costs more then traditional duct wrap, it will last through floods and typical vapor issues. When insulating your home inland, we prefer to spray foam the walls in our retrofit division. Our team will install a 12 mil scrim reinforced vapor barrier, and spray foam your walls for a completely sealed crawl space. Once this is done and we also like to condition the space with a supply and return duct. This in the winter time, will drive heat up through your floors making your home a comfortable paradise all year round!!! Who does the NJ Home Performance with Energy Star program? Coastal Insulation is a BPI Goldstar contractor. Coastal is an approved contractor in the NJ HPwES program. This program offers rebates, and zero percent financing to qualified home owners. Who is the best insulation company in New Jersey? 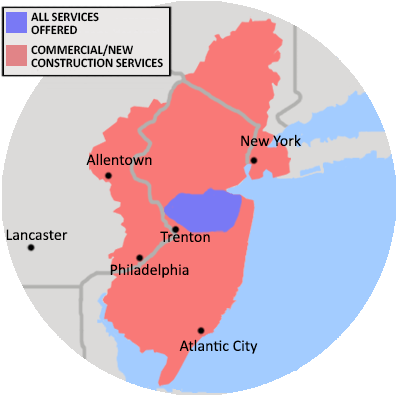 The best insulation company in New Jersey is Coastal Insulation. We provide new construction, existing homes, commercial and industrial with fiberglass batts, blown insulation and spray foam insulation for the entire state of New Jersey. Coastal is the Northeast region's largest spray foam contractor!